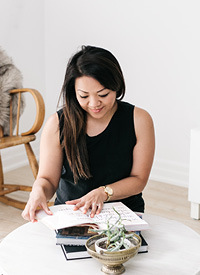 Decorating My Teak Dresser — Love On Sunday Love On Sunday | Interior Styling in Toronto and the GTA. Okay, maybe not decorating. More like organizing. This poor piece has been used and abused. I've had this dresser for a long time now. In fact, it's followed me to 4 different homes. It was a friend of a friends that would have otherwise been left at the curb if I didn't snag it for myself. When I was living with roomies we used it in the living room to store housewares and cds. I also used it as a media console with a TV on top. So I just love the versatility of this piece. I currently use this in my bedroom as a dresser, which sits in front of a large window. I've always wanted to try and decorate this area a little nicer but could never decide on anything. Maybe because it's such a wide space, or because it sits in front of a window? I don't know. So this is my first crack at making it look a little nicer but still comfortable. You can't see it in the photos but it's pretty beat up. It has cup marks that won't come off, scratches, broken pieces- it's definitely seen better days. But I LOVE it. I guess you can say I'm 'embracing Wabi-Sabi'. (Thanks Kisha for introducing this term to me. You can read more about Wabi-Sabi on her post here). According to Wikipedia: "The aesthetic is sometimes described as one of beauty that is "imperfect, impermanent, and incomplete"
I love jewelry and have lots of it. Lately I've been trying to clean out my drawers and only keep the ones that I absolutely love and wear on a daily basis. Other items like that pretty cylinder jewelry case was a gift which I LOVE, the wooden bust was a thrifty find and the carved box was from a trip to Cuba. But my most favourite part of this dresser are these beautiful earrings that belonged to my grandmother. She loved jewelry and I remember being a teenager and loving the smell of all those wooden boxes she had filled with all kinds of baubles. After she passed, my Mom gave me these 2 pairs which I wear often and cherish with all my heart. We also have his and hers watch boxes which house my boyfriends expanding watch collection and some favourite books of mine (and yes, I love to read about furniture history!). This bell jar was another thrifty find. It has this gorgeous bronze top with an amazing patina on it. It did have a small plant inside but it outgrew the jar! Hmm....what to replace it with? What favourite things do you have on your dresser? Do you have any ideas to spruce up mine?